A great look anytime, this custom made pave diamond pendant demands much attention. 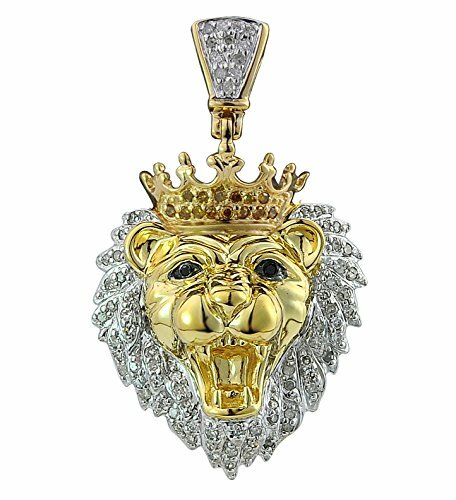 Crafted in warm 14K yellow gold, this 35 mm pendant features a three dimension sculpture of a lion face with a crown. I1-I2 clarity diamonds boasting G-H color, this pendant captivates 0.34ct. diamonds. Additional diamonds glistens the pendant's bale. This handsome pendant is caged back for his comfort and weighs approx 5.7 grams. All diamonds are 100% natural. 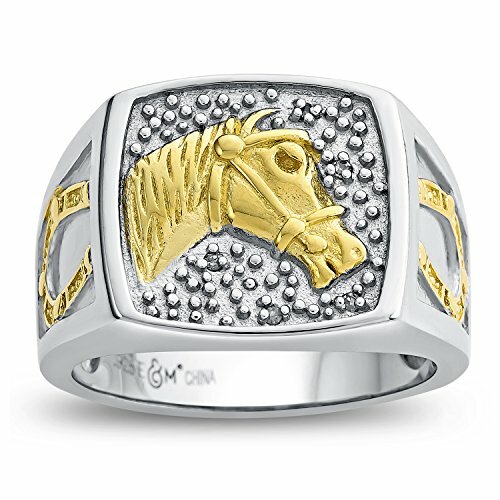 This sterling silver men's ring features a horse head design on top, and horse shoes on each side. This ring is accetuated dy diamond accents. Esty & Me is a family-owned jewelry boutique that values family and is driven by making them proud. Inspired by these values, and since we began in the jewelry industry almost 4 decades ago, our focus has been on creating quality, unique products that are both beautiful and affordable for customers. 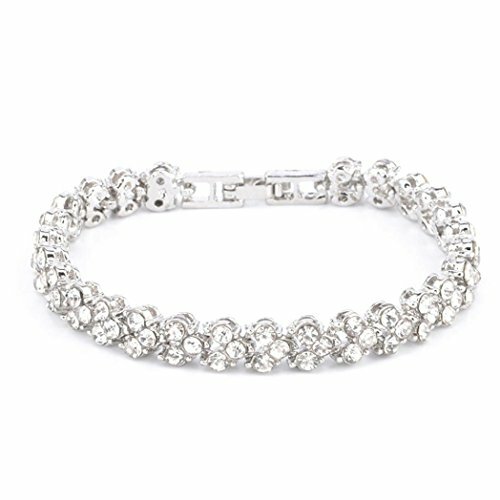 We offer a wide range of fine jewelry and fashion jewelry for both males and females of all ages. From personalized charms, birthstone pieces, to standout rings for both men and women, we have a bit of everything for everyone. Over the years, we have created the ability to insert individual birthstones into our pieces through patented tools and specialized techniques. This gives us the ability to personalize any item for customers in just a few seconds- a rare ability in the jewelry industry. We hope you enjoy our products, and that they help share messages of love and significance to you or those you may be gifting our products to. We encourage you to reach out directly to us if you have any questions at all about sizing, product material or design, or whatever else we may be able to help you with. Cheers! 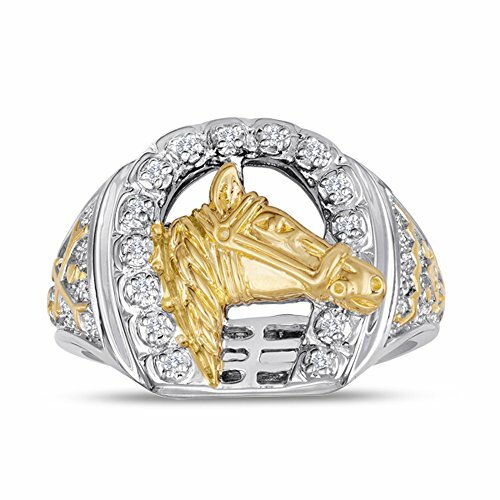 Men's Two Tone Horse Head Ring in Sterling Silver. 15 diamonds - total diamond weight is 0.08 carats. Esty & Me is a family-owned jewelry boutique that values family and is driven by making them proud. Inspired by these values, and since we began in the jewelry industry almost 4 decades ago, our focus has been on creating quality, unique products that are both beautiful and affordable for customers. We offer a wide range of fine jewelry and fashion jewelry for both males and females of all ages. From personalized charms, birthstone pieces, to standout rings for both men and women, we have a bit of everything for everyone. Over the years, we have created the ability to insert individual birthstones into our pieces through patented tools and specialized techniques. This gives us the ability to personalize any item for customers in just a few seconds- a rare ability in the jewelry industry. We hope you enjoy our products, and that they help share messages of love and significance to you or those you may be gifting our products to. We encourage you to reach out directly to us if you have any questions at all about sizing, product material or design, or whatever else we may be able to help you with. Cheers! 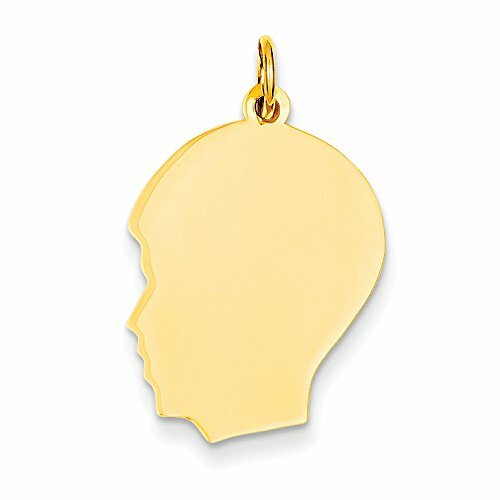 Crafted in 14K yellow gold, this engraveable charm features a profile view of a boy head. Features:Material: Purity:925Finish:PolishedLength of Item:29 mmChain Length:1.87 inCharm/Element Length:25 mmCharm/Element Thickness:0.46 mmCharm/Element Width:21 mmFeature:SolidMaterial: Sterling SilverWidth of Item:21 mmEngravable:YesProduct Type:JewelryJewelry Type:Pendants & CharmsBail Width:1 mmMaterial: Color:WhiteBail Length:4 mmFeature 2:Satin BackAll weights and measurements are approximate and may vary slightly from the listed information. Features:Material: Purity:925Finish:PolishedLength of Item:29 mmChain Length:3.71 inCharm/Element Length:25 mmCharm/Element Thickness:0.89 mmCharm/Element Width:21 mmFeature:SolidMaterial: Sterling SilverWidth of Item:21 mmEngravable:YesProduct Type:JewelryJewelry Type:Pendants & CharmsBail Width:1 mmMaterial: Color:WhiteBail Length:4 mmFeature 2:Satin BackAll weights and measurements are approximate and may vary slightly from the listed information. 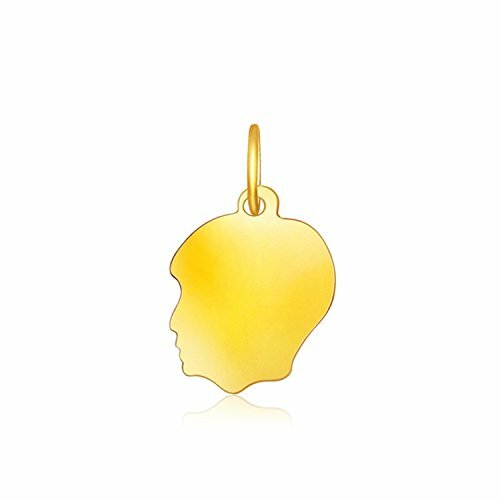 Looking for more Diamond Boys Head Charm similar ideas? Try to explore these searches: Carhartt Mens Sherpa, Basketball Salt, and Schwinn Training Wheels. 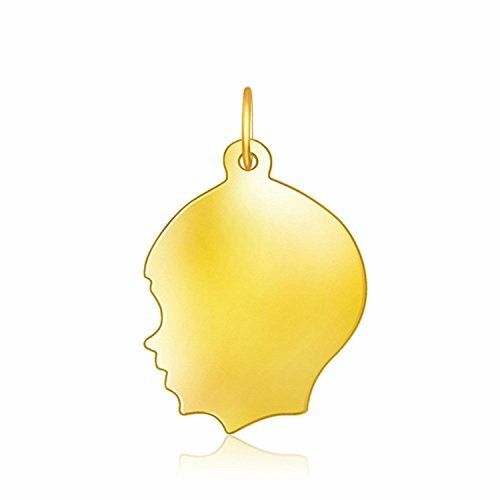 Look at latest related video about Diamond Boys Head Charm. Shopwizion.com is the smartest way for online shopping: compare prices of leading online shops for best deals around the web. 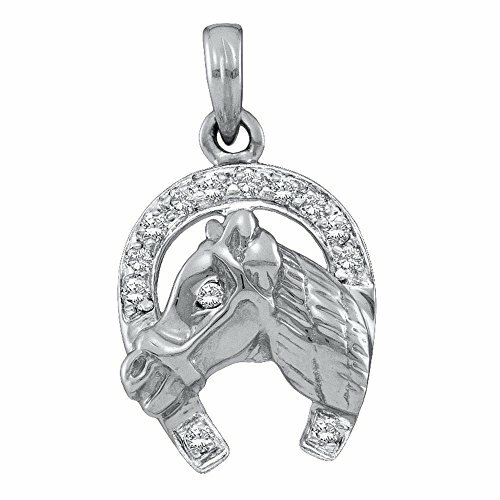 Don't miss TOP Diamond Boys Head Charm deals, updated daily.